Observing courtship behaviour was real fun. Their social conduct and romance reminded me my pet dogs. The chapter of romance was a usual seen till mid October. Suddenly this pair of lover wild dogs disappeared. I just saw them once retuning from stream side quite late in the evening. They were near bungalow for that night. Then there was no news of this pair. No sightings, no pug marks and not even deer alarms during day time announcing presence of wild dogs in the area. Meanwhile a new group of the nine wild dogs kept visiting our area. Every time it was easy to identify this pack. Sometimes their number even went down till seven but alpha female in this pack was having distinctive feature. Her left ear was cut in half. She seems to be a courageous leader and possessive mother. She had real command on the pack and was very compassionate towards pack members. After few visits this pack disappeared somewhere. So almost for two weeks there was again no news of wild dogs. Everyone was worried about a lover pair. Everyone in resort was looking around for them. But bad luck we couldn’t trace them. We started feeling that they might have got disturbed and changed their mind to settle down in the premises of our resort for their mating season. Now they will make their den somewhere else. We lost the chance to see a family time of wild dogs. But jungle has its own ways to reveal the mysteries. On 3rd of November this pair showed up. Actually they visited a half eaten carcass of the spotted deer. It so happened that on 2nd November spotted deer were settled down near the staff accommodation area. At 1.30 am tiger killed a stag at the very same spot and dragged it under a fig tree on the eastern coroner of our resort. Few enthusiastic guests noted this drama even at darkest and silent hour of night. They were so accurate that in morning we could locate the carcass. And then like any wildlife enthusiast I made an attempt to sit over kill for the night. But, this bravado put everyone in great worry and I had to climb down at 10pm. Even on that night tiger had returned on his kill to finish half eaten meal. Next morning skin and bones and chewed up leftovers of rib-case started smelling. First wild bores hurried to the spot and tore down leftovers into pieces. Then after these fatty giants wild dogs came to have their share. 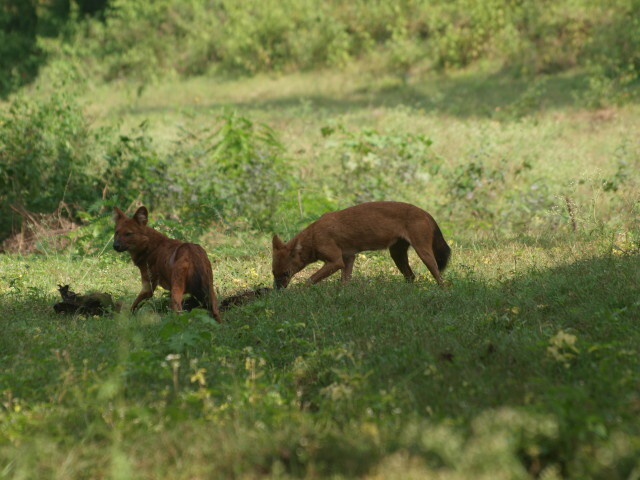 In no time I could recognize our loving and romantic dhole pair. 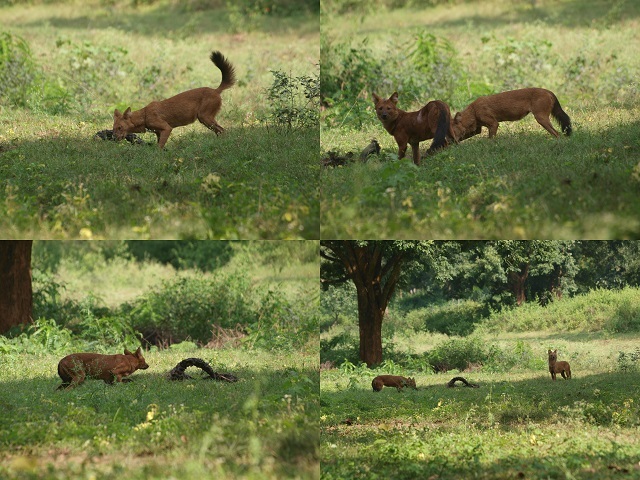 We had a sigh of relief after seeing our resident wild dog pair in healthy condition. Both the partners were in perfect health. A male wild dog was now having some skin infection and seemed to lose a patch of his fur but otherwise both were looking fine. It was not unusual to see them scavenging. They might not have tasted deer meat for long time as there were just two of them and its bit difficult for a pair of wild dogs to chase a deer. They were so hungry and so happy to feast on free meal that they allowed me to sit down just 20 feet away from them. I kept clicking joyfully. After a long time I was meeting my friends. Now we even know where their den is going to be and we are waiting for the moment when finally our pair of lover wild dogs will introduce us to their pups. We are eagerly waiting for our new little friends to venture in wilderness and allow us to be a part of their life. Come and experience the unexpected, only at InnTheWild, Masinagudi.